by Green, Samuel B.; Salkind, Neil J. 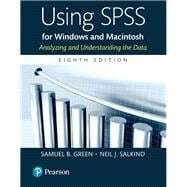 Using SPSS for Windows and Macintosh guides students through basic SPSS techniques, using step-by-step descriptions and explaining in detail how to avoid common pitfalls in the study of statistics. Authors Samuel Green and Neil Salkind provide extensive substantive information about each statistical technique, including a brief discussion of the technique, examples of how the statistic is applied, a sample data set that can be analyzed with the statistic, a discussion of the analysis results, practice exercises, and more. The Eighth Edition has been updated for SPSS version 23 (Windows/Mac), and now offers added accessibility and increased problem solving. Samuel B. Green is a professor in the T. Denny Sanford School of Social and Family Dynamics at Arizona State University. Previously he was a professor in the Psychology Department at Auburn University and in the Department of Psychology and Research in Education at the University of Kansas. He conducts research primarily in the areas of structural equation modeling, factor analysis, multivariate analyses of means, and reliability. He has authored or coauthored articles in a variety of journals, including Psychological Methods, Structural Equation Modeling: A Multidisciplinary Journal, Psychometrika, Multivariate Behavioral Research, Applied Psychological Measurement, Educational and Psychological Measurement, Educational Measurement: Issues and Practices, and Methodology. He currently is on the editorial boards of Structural Equation Modeling: A Multidisciplinary Journal, Psychological Methods, Educational and Psychological Measurement, and Journal of Counseling Psychology. Neil J. Salkind is a professor emeritus of educational psychology at the University of Kansas, where he taught for 35 years. He received his degree from the University of Maryland's Institute for Child Study and has published numerous journal articles and books, among them being Using SPSS with Sam Green (Prentice Hall), Exploring Research (Prentice Hall), and Statistics for People Who (Think They) Hate Statistics (Sage). He is active in the Society for Research in Child Development where he edited the journal Child Development Abstracts & Bibliography, and the American Psychological Association. He lives in Lawrence, Kansas.